abstract thought between right and wrong. My closing thoughts on the Confederate Flag. I feel that the future of this debate, if there is one, depends highly upon how well we understand history. When I look at history and the intricate relationships that formed the Confederate flag and what it represented at that time, I cannot help but to synthesize a conclusion that symbolism is both a powerful yet potentially dangerous motivator, in this case good or bad, you decide. The simple thought of symbolism and its implications from a bygone era contemporaneous with the emergence of divergence among millions of Americans is as powerful today as it was when slavery began. This is another area where even I have to admit, I did not know the full truth, and slavery came about long before racism. Our legacy of slavery began in the early 1600s, but every society and culture has had in some form and time slaves. Slavery in North America actually has its roots planted, in the 14th century, when Spain and Portugal captured Africans for enslavement in Western Europe. Once Spain and other European countries had ventured and laid claim to parts of North America in the late 16th century, slavery was brought with them, as it had already been a part of their culture for nearly 200 years. Most notably were the slaves brought to Jamestown by a Dutch ship in 1619. There were 20 Africans, all of whom were indentured servants. By being indentured, they would work for a certain period in exchange for transportation, housing, and food. They were also given land after their service and were then considered free Negroes. In comparison to life in the 21st century where one must work, often up till or near death to pay for their home and food, hardly making ends meet, one might think that the rewards of being indentured: housing, food and land was actually a more desirable system. Of course, not all that gleams is gold and the downside to this system was the involuntary settlement of Africans from their homeland, often under brutal conditions. Since that time, the complexity of the relationship expanded, as well as the practice and need for more slaves as greed grew exponentially due to a cash crop that changed the new world; cotton. Luckily, for Southerners their greedy needs were addressed by a war that had its roots planted deep in the slavery of Africans now under the Flag of the Confederacy. In closing, I would like to propose one human truth about symbolism in America or the World for that matter. Symbolism has always been a powerful motivator, the sun, which has been worshipped by innumerable cultures, playing a central role in most of the world's traditions. The many deities, all of whom had with them interconnected truths and deceits brought together to form the basis of a belief system that could only be propagated by the power of symbolism. 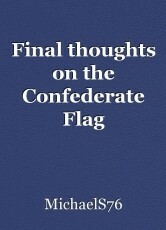 It is only when you look at an abstraction such as the symbolism of the Confederate Flag without past and prevailing prejudices, can you come to a conclusion based solely and purely on human analytical abstract thought between right and wrong.